Greek cuisine (Greek: Ελληνική κουζίνα, translit. Elliniki kouzina) is a Mediterranean cuisine. Contemporary Greek cookery makes wide use of vegetables, olive oil, grains, fish, wine (white and red), and meat (including lamb, poultry, veal, beef, rabbit and pork). Other important ingredients include olives, pasta (especially hyllopites, a kind of pasta similar to tagliatelle), cheese, lemon juice, herbs, bread and yoghurt. The most commonly used grain is wheat; barley is also used. Common dessert ingredients include nuts, honey, fruits, and filo pastries. It is strongly influenced by Ottoman cuisine and thus, especially cuisine of anatolian Greeks shares foods such as baklava, tzatziki, gyro, moussaka, dolmades, yuvarlakia and keftethes with the neighboring countries. To an even greater extent it is influenced by Italian cuisine and cuisines from other neighboring south European countries, and thus, especially in southern regions and the islands it includes several kinds of pasta, like hyllopites, gogkes and tziolia. Greek cuisine has a culinary tradition of some 4,000 years and is a part of the history and the culture of Greece. Its flavors change with the season and its geography. Greek cookery, historically a forerunner of Western cuisine, spread its culinary influence, via ancient Rome, throughout Europe and beyond. It has influences from the different people's cuisine the Greeks have interacted with over the centuries, as evidenced by several types of sweets and cooked foods. Byzantine cuisine was similar to the classical cuisine, with the addition of new ingredients, such as caviar, nutmeg and basil. Lemons, prominent in Greek cuisine and introduced in the second century, were used medicinally before being incorporated into the diet. Fish continued to be an integral part of the diet for coastal dwellers. Culinary advice was influenced by the theory of humors, first put forth by the ancient Greek doctor Claudius Aelius Galenus. Byzantine cuisine benefited from Constantinople’s position as a global hub of the spice trade. The most characteristic and ancient element of Greek cuisine is olive oil, which is used in most dishes. It is produced from the olive trees prominent throughout the region, and adds to the distinctive taste of Greek food. 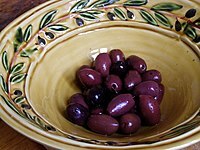 The olives themselves are also widely eaten. The basic grain in Greece is wheat, though barley is also grown. Important vegetables include tomato, aubergine (eggplant), potato, green beans, okra, green peppers, and onions. Honey in Greece is mainly honey from the nectar of fruit trees and citrus trees: lemon, orange, bigarade (bitter orange) trees, thyme honey, and pine honey. Mastic (aromatic, ivory-coloured resin) is grown on the Aegean island of Chios. Greek cuisine uses some flavorings more often than other Mediterranean cuisines do, namely oregano, mint, garlic, onion, dill and bay laurel leaves. Other common herbs and spices include basil, thyme and fennel seed. Parsley is also used as a garnish on some dishes. Many Greek recipes, especially in the northern parts of the country, use "sweet" spices in combination with meat, for example cinnamon, allspice and cloves in stews. Some dishes can be traced back to ancient Greece: lentil soup, fasolada, retsina (white or rosé wine flavored with pine resin) and pasteli (candy bar with sesame seeds baked with honey); some to the Hellenistic and Roman periods: loukaniko (dried pork sausage); and Byzantium: feta cheese, avgotaraho (cured fish roe) and paximadi (traditional hard bread baked from wheat, barley and rye). There are also many ancient and Byzantine dishes which are no longer consumed: porridge as the main staple, fish sauce, and salt water mixed into wine. Many dishes entered Greek cuisine from Ottoman cuisine: moussaka, tzatziki, yuvarlakia, keftethes, boureki, and so on. Horta: wild or cultivated greens(usually Dandelion Greens), steamed or blanched and made into salad, simply dressed with lemon juice and olive oil. They can be eaten as a light meal with potatoes (especially during Lent, in lieu of fish or meat). Kalamarakia: deep-fried squid sliced in rings. Also known as "calamari"
Skordalia: thick garlic and potato purée, usually accompanies deep fried fish/cod (bakaliaros skordalia, i.e. fried battered cod with garlic dip, a very popular dish). Tyropita: a white cheese (usually feta or mizithra) pie with phyllo pastry. When yellow cheese (usually kasseri) is used, it is called Kasseropita. Also, several pitas found all over Greece, such as Kolokythopita, Mizithropita (Crete), Melintzanopita, Tsouknidopita, Kremydopita, Kreatopita (meat pie), Galatopita, Marathopita, Malathropita (Chios), Ladopita, Fanouropita, Sikopita, Tahinopita. Anginares a la Polita: artichokes Constantinople style with artichoke hearts, olive oil, potatoes, carrots, and dill. Tomatokeftedes: tomato fritters with mint, fried in olive oil and typically served with fava (split-pea purée). Mainly a Cycladic island dish. Gyros: meat (usually lamb, pork, beef, or a combination thereof) roasted on a vertically turning spit and served with sauce (often tzatziki) and garnishes (tomato, onions) on pita bread, or served as a sandwich wrapped in pita bread together with tomatoes, onions, tzatziki, and french fries; a popular fast food. Strapatsada: eggs scrambled in olive oil and fresh tomato purée, seasoned with salt, pepper and oregano. Often includes feta cheese. Galaktoboureko, custard baked between layers of phyllo, and then soaked with lemon-scented honey syrup. The name derives from the Greek gala (γάλα), meaning milk, and boureki (μπουρέκι), meaning filled, thus meaning "filled with milk". Greece has the eighth highest per capita coffee consumption worldwide. The origins of wine-making in Greece go back 6,500 years and evidence suggesting wine production confirm that Greece is home to the oldest known grape wine remnants discovered in the world and the world’s earliest evidence of crushed grapes. The spread of Greek civilization and their worship of Dionysus, the god of wine, spread Dionysian cults throughout the Mediterranean areas during the period of 1600 BC to the year 1 AD. Greece's viticultural history goes back to prehistoric times,[i] and wine production was thriving until the 11th century. After World War II, Greek winemakers imported and cultivated foreign grape varieties, especially French ones, in order to support local production. In 1960s, retsina, a dry white wine with lumps of resin, was probably the most well-known Greek wine abroad. In recent years, local varieties are rediscovered and often blended with foreign ones. In early 1980s, a system of appellations, modelled on the respective French one, was implemented to assure consumers the origins of their wine purchases. Today, there are 28 appellations (Appellations of Origin of Superior Quality and Controlled Appellation of Origin) throughout the country, from Macedonia to Crete. ^ Discoveries, such as a wine press at Palekastro in Crete, dated to the Mycenaean period, and references related to wine in Linear B tablets indicate that, at this period, wine was widely produced and consumed both on the Greek mainland and in the islands. ^ Τονια Τσακιρη. "Η Goody's νίκησε στον πόλεμο με τη McDonald's - οικονομικές ειδήσεις της ημέρας - Το Βήμα Online". Tovima.gr. Retrieved 4 May 2014. ^ "When And How Greeks Eat". Ultimate Guide to Greek Food. Retrieved 11 June 2016. ^ "Gigantes/Yiyantes (Greek Giant Baked Beans)". Thursdayfordinner.com. 16 November 2008. Retrieved 4 May 2014. ^ Walsh, Robb (2015). The Chili Cookbook. Berkeley CA: Ten Speed Press. ISBN 1607747952. ^ "Diples (Thiples) (Honey Rolls) Greek Dessert". Thursdayfordinner.com. 28 December 2008. Retrieved 4 May 2014. ^ a b 6,500-year-old Mashed Grapes Found in Greece Archived 8 October 2012 at the Wayback Machine. Discovery News (16 March 2007). ^ Jacobson, Jean L. (2006). "Berry to Bottle". Introduction to Wine Laboratory Practices and Procedures. Springer. p. 84. doi:10.1007/0-387-25120-0_4. ISBN 978-0-387-24377-1. Kousoulas, Kostas (2001). "Naousa and its Wines" (PDF). Niaousta (in Greek). 94: 32–35. Archived from the original (PDF) on 26 April 2012. Retrieved 26 December 2011.